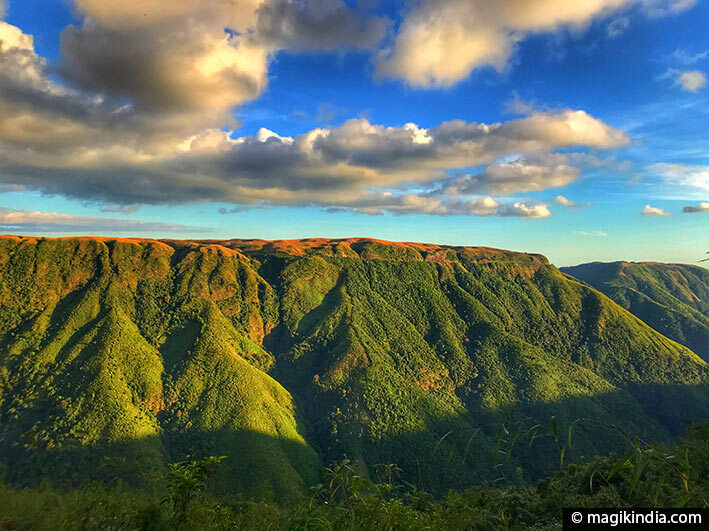 Meghalaya, literally ‘the abobe of clouds’, is one of the seven states of Northeast India also known as the ‘seven sisters’. This state, the wettest in India, is slowly opening up to tourism and an increasing number of nature lovers get mesmerised by its unspoiled landscapes. Whether during the monsoon, when the mist hangs over the highlands, or during the dry season, Meghalaya offers the traveler a wonderbox filled with natural treasures: lushy ancient forests, stunning waterfalls rolling down the mountains and surprising living root bridges ingeniously weaved by the tribal communities. The monsoon season from mid-June to September offers the traveler a grandiose spectacle: hundreds of waterfalls flow out of the highlands and cascade down bubbling gorges. A mysterious carpet of clouds hangs over the hills and meadows of intense green grass covers the landscape. The dry season, from November to June, offers landscapes painted with autumnal colors. Some waterfalls go dry but the clear sunny weather of this season allows to visit some places that are otherwise immersed in mist and fog during the monsoon. 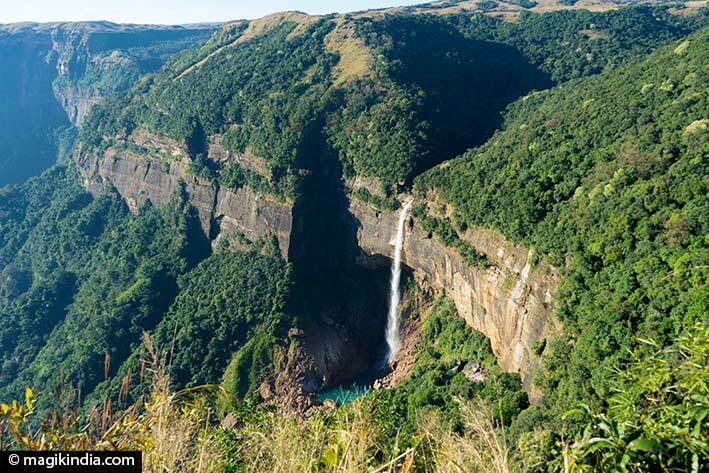 The ideal would be to visit Meghalaya during both seasons! 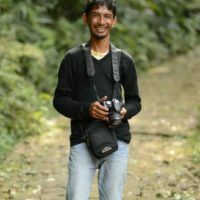 Some pieces of advice : I suggest you to hire a local guide from one of the tribal communities of Meghalaya, he or she knows the most attractive and authentic places of Meghalaya. Taxi is the best transportation, especially in the Jaintia hills, you’ll save time and you’ll be able to reach all places, even the most remote. Meghalaya is ‘the abode of clouds’ referring to the clouds of monsoon arising from the valleys and hanging over the highlands. To me, it deserves also another name : the abode of one thousand and one waterfalls. 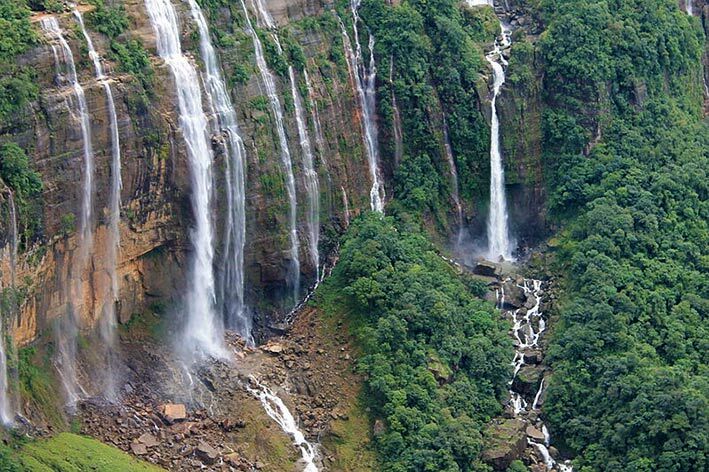 No doubts Meghalaya together with Kerala and Chhattisgarh has the most stunning waterfalls in India. 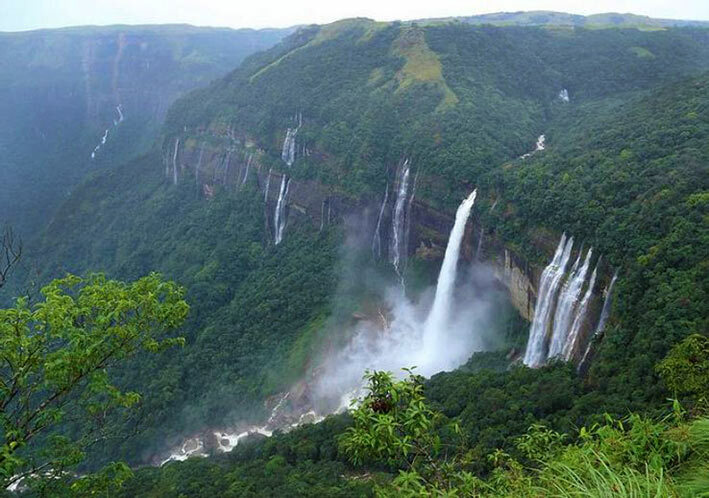 The large number of waterfalls in Meghalaya is due to a high rainfall rate (annual average of 10,000 mm); Meghalaya is the most rain soaked state of India. The landscape is thus shaped by this climate: 70% of the territory is covered with dense primary forests containing one of the richest fauna and flora of Asia. 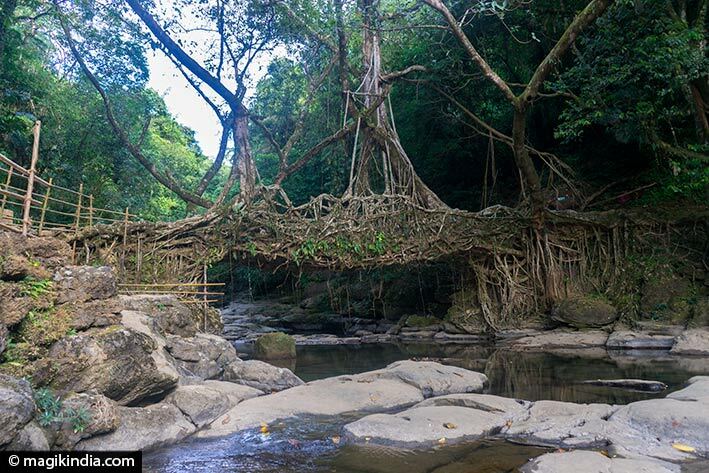 Meghalaya is famous all over the world for its bridges ‘woven’ by the Khasi and Jaintia people using the aerial roots of the rubber fig tree (ficus elastica). 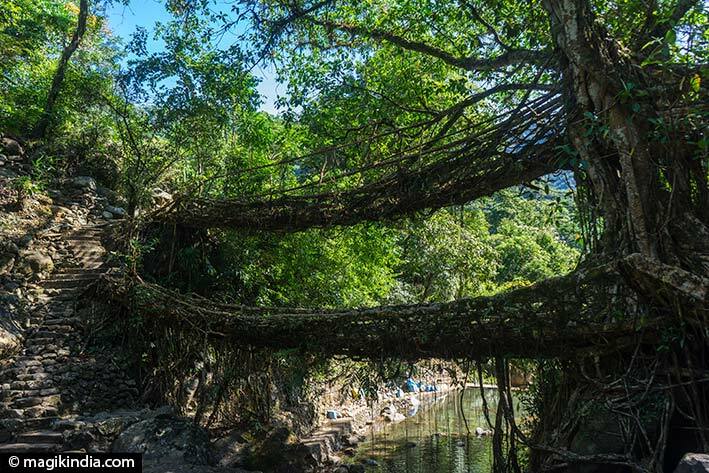 Living root bridges have also been observed in Nagaland (India) and in Indonesia. 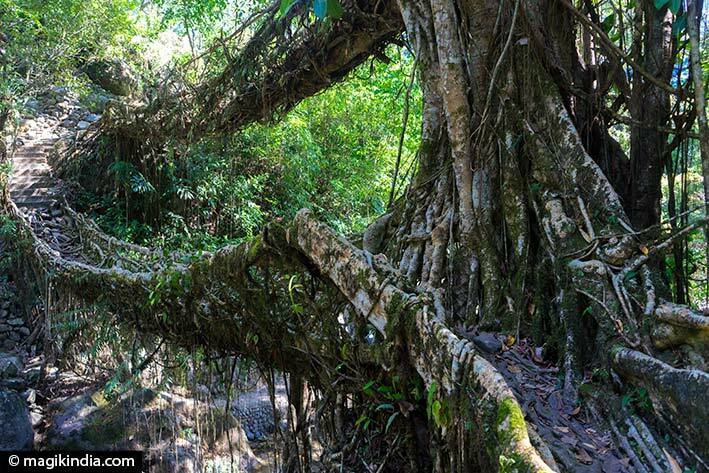 Living root bridges are an ingenious natural way of connecting two banks of a stream by folding and braiding the young shoots of the Ficus Elastica tree until they become stronger for people to be able to use it. A living root bridge can last hundreds of years; the bridge is self-renewing and naturally strengthening as its roots grow. Meghalaya is one of those states in India where tribal people make up majority of the population. The three main tribes of the state are Khasis, Garos and Jaintias. These tribes are also called ‘hill tribes’ because they live respectively in the hills of Khasi, Garo and Jaintia. These communities were for most of them christianised in the 19th century; nowadays about 75% of the population in Meghalaya practices Christianity. In the lushy forests of Meghalaya, there are what it is called ‘sacred groves’. 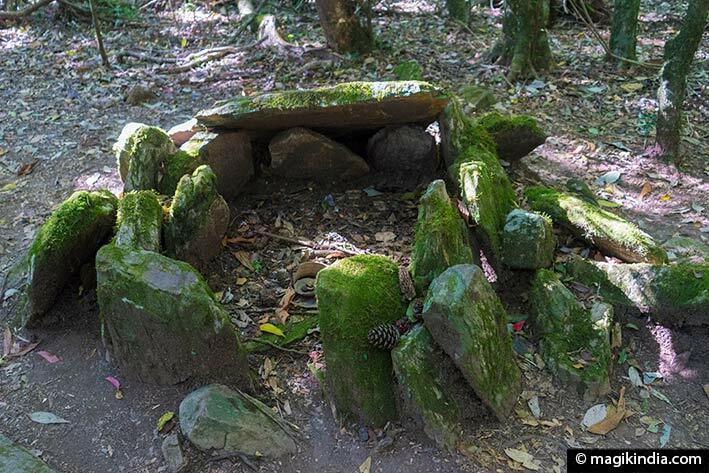 These small ancient forests have been preserved by local communities, the Khasi tribes, because of religious and cultural beliefs. They are generally protected from exploitation and thus they are a home to many rare plant species. 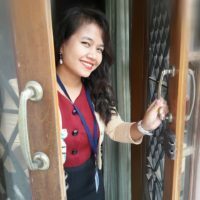 According to a report by the McKinsey Global Institute, Meghalaya and Mizoram are the two states in India where the gender gap is the lowest. Girls there feel more free, they feel less the pressure of marriage and, in cities, they go hand in hand to rock concerts (very famous in Meghalaya) with their boyfriends. 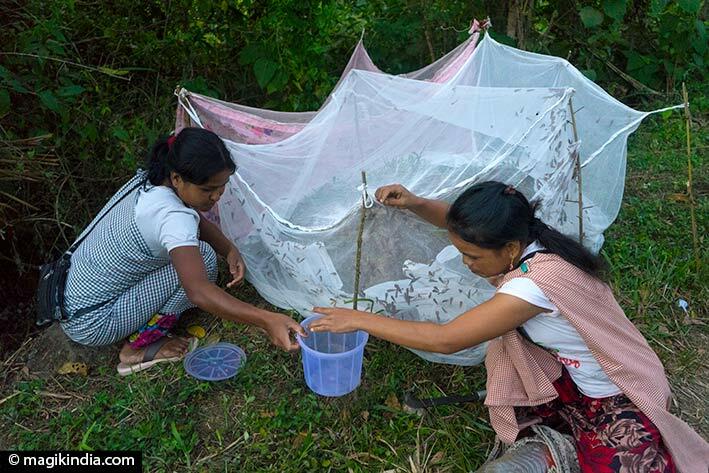 Another fact, unique in India: several tribes (like the Khasi) practice matrilineal descent. Women are given a dominant role: for example, the youngest daughter in the family inherits all the ancestral property. After the marriage, the husband live in the mother-in-law’s house and the mother’s surname is given to the children. But make no mistake about it, the matrilineal system is not a matriarchy. Women are still a few in high responsibility job and, even at a local level, they are still a rarity in village councils. Meghalaya is divided into several districts (see the map at the beginning of the page). The East Khasi Hills is the most visited part of the state because of fabulous waterfalls and the famous living root bridges. I start my visit with the capital of Meghalaya: Shillong. 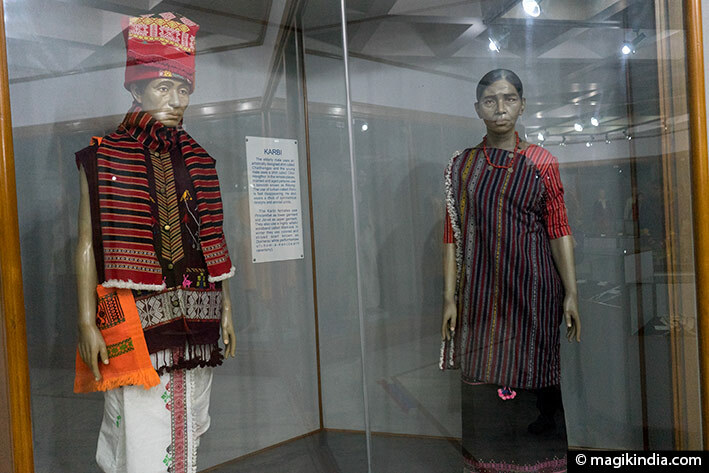 This small town doesn’t offer many exciting visits but the ‘Don Bosco Museum of Indigenous Cultures’, a 4-storey museum gives a good insight into the lifestyles of the indigenous peoples of Northeast India. The vibrant Iewduh market, or Bara Bazaar, where all kinds of food and clothing are sold is also worth a look as Ward lawell as the ward’s lake and the golf course, one of the largest in Asia. In Meghalaya, the cherry trees bloom in autumn! Each state of India has its own originality: In Meghalaya, the cherry trees bloom in autumn! 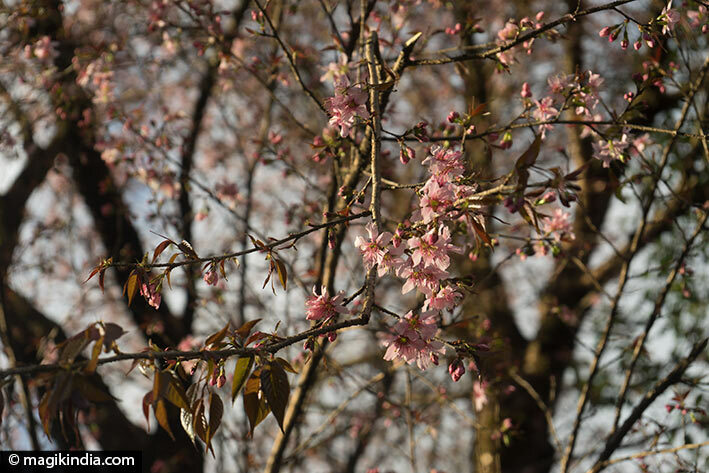 This peculiarity is due to a certain cherry tree variety: the ‘prunus yedoensis’ of Japan blooms in spring while the ‘prunus cerasoides’ of Shillong and its surroundings is adorned with pink and white flowers in autumn. The state of Meghalaya, which sees this feature as a tourist asset, has been organizing for two years in Shillong, the International Cherry Blossom Festival. Cultural programs, rock concerts and tribal cuisine are part of the festivities. 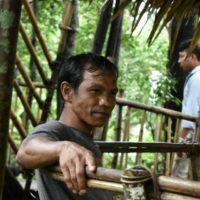 In Shillong, I have the chance to meet a local guide of the Khasi community, with an unusual name: Earlyborn because he was born very early. I will continue my journey with him and his precious advices and his good experience of Meghalaya. The next visit leads me to the village of Mawphlang, about 20 kilometers from Shillong where there is a sacred grove. It is said that it is protected by the local deity Labasa. A young guide from the Khasi community shows me the sacred place which, although it is no longer active, retains its mystical atmosphere. While moving inside the forest, one falls on moss-covered monoliths, which mark the place where rituals were performed once. In front of the sacred wood, one can visit the ‘Heritage Village’, which shows the different habitats of the Khasi tribes. 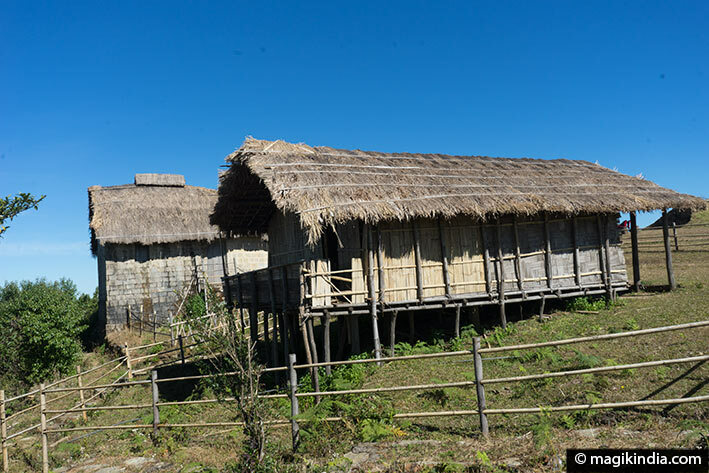 The ‘Heritage Village’, which exposes the different habitats of the Khasi tribes. We take the road again to Cherrapunjee (Sohra), 50 km from Mawphlang. Sohra, is the most visited region of Meghalaya and for good reason, it is dotted with magnificent waterfalls and there are also the famous living root bridges. The road along the Shillong Valley to Cherrapunjee offers a majestic view of the rolling the East Khasi Hills. To take a break and admire these landscapes, travelers often stop at the Duwan Singh Syiem Bridge, used in the shooting of the Bollywood movie “Qurban”. If you crave an adrenaline rush, a zip-line plunging into the valley has been built. On the road, we can see from a distance the village of Lad Mawphlang, which is the end of a well-known trek in Meghalaya: The David Scott Trail. The David Scott’s Trail is one of Meghalaya’s most popular trekking routes and was named in honor of David Scott, a British officer who discovered this mule track, in the first half of 1800s, that leads to Bangladesh. 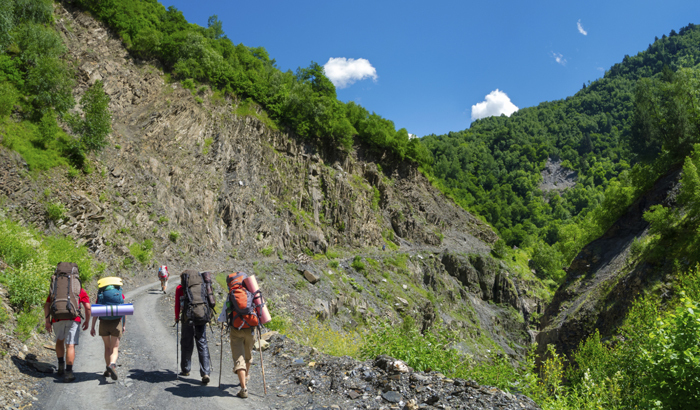 This route covers more than 100 km and takes about 5 days of walk. This trail is, however, divided into smaller treks like the one starting at Mawphlang village (see above) and ending 16 km further down at the village of Lad Mawphlang. 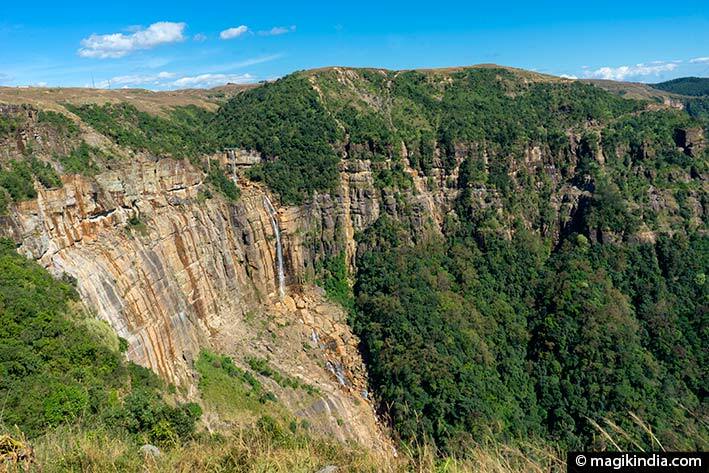 This route is dotted with waterfalls and typical Khasi villages. The following visits lead me to several waterfalls. They are often associated with legends that gave their name to the falls. This waterfall is located in Umstew. It is said that two fairies would live in this fall: a black and a white and they used to walk around incognito during the market days trying to hypnotize young men. The waterfall is name after ‘U Thlen’, a gigantic legendary serpent that lived in a cave nearby the waterfall. It is said that one can still see the deep scars left on the rocks of the waterfall following the long battle against the snake demon. Below the waterfall of Dainthlen, after a short trek through a steep and slippery slope, the three-level waterfall and three ponds of Wei Sawdang appears: it’s a small marvel with clear waters that is still little known. 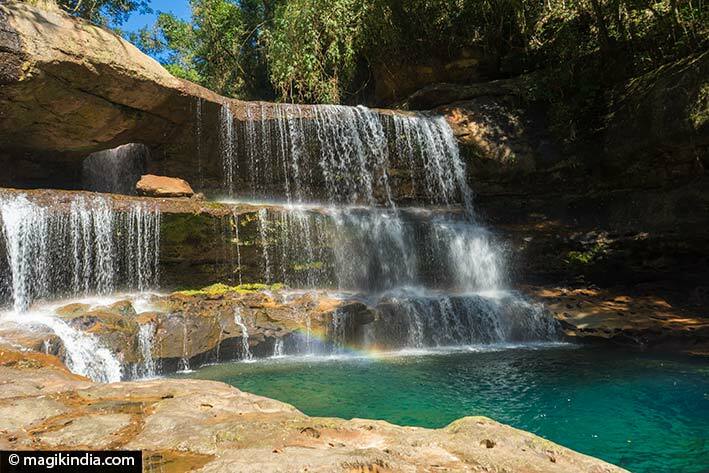 This long and beautiful waterfall plunging into a pool of turquoise water yet has a tragic story: it is said that a mother overwhelmed by grief threw herself in these falls following the murder of her daughter by her husband. We continue our road towards Mawsmai. 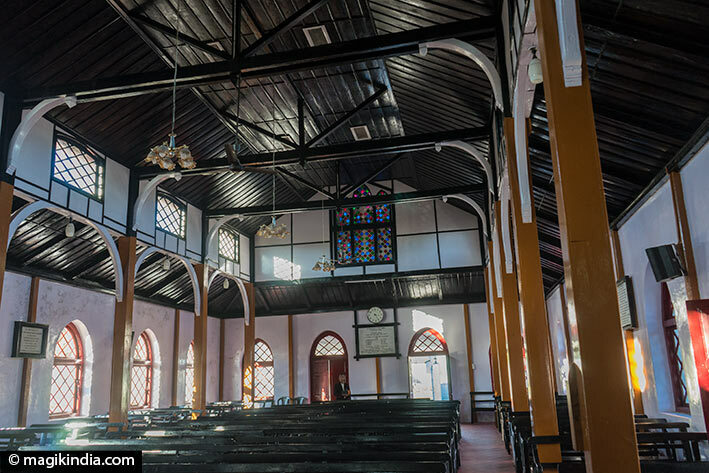 On the way, we make a short stop at the Presbyterian Church of Nongsawlia, the first Christian church established in Meghalaya, dating back to 1846. Nohsngithiang Falls or Mawsmai Falls are located 1 kilometer south of the village of Mawsmai. 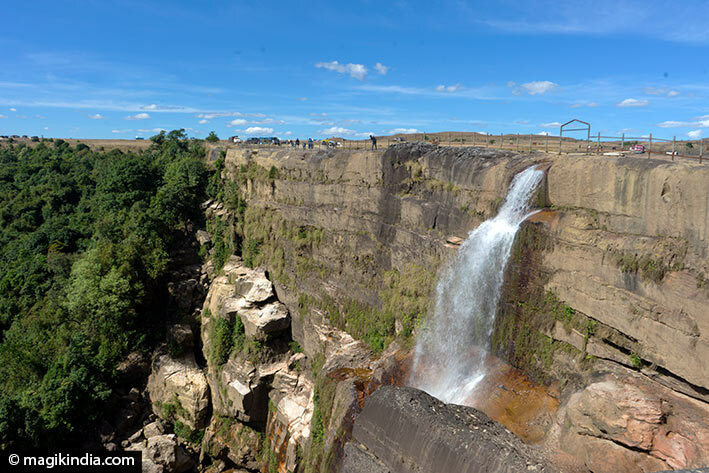 They are also known as the ‘Seven Sisters’ waterfalls, as they are divided into seven streams of water (they are actually more than seven of them) that spring from the limestone cliffs of the Khasi Hills and cascade 300 meters down. An Eco-Park is built on the plateau at the top of the fall but you can save some money and see them from the road along the cliffs. 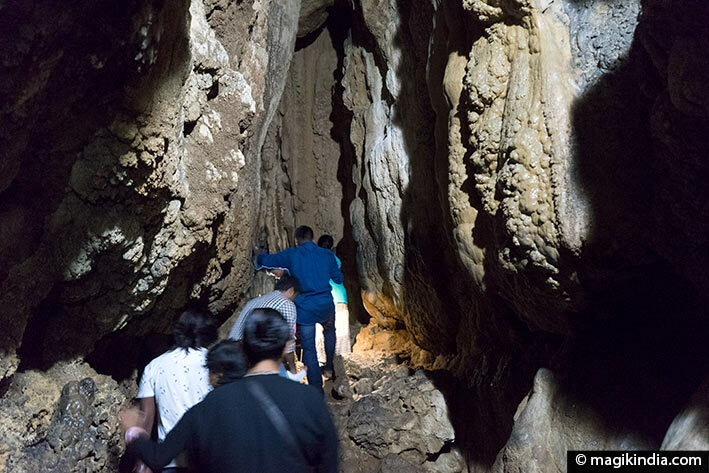 Located about 6 km from Cherrapunjee, these 150 meters long caves display some interesting stalactites and stalagmites formations but they are far from being astonishing. If your schedule is tight, you can skip this visit. The highlight of the visit around Cheerapunji is undoubtedly the double living root bridge. But we must deserve it! It is reached by descending 3,500 steps through the villages of Nongthymmai and Mynteng. The double living root bridge is located in the village of Nongriat where guesthouses welcome you for one or more nights. After admiring the clever braiding of the bridge, I continue my walk and, 6 km further, I discover the rainbow waterfall, which worth the effort. Bathing in its crystal waters is a must. The trek back is tougher, especially when you have to go up the 3500 steps. We return to Shillong to take the national road till the West Jaintia Hills. The Jaintia hills located to the South-East of the state is divided into two districts: East Jaintia and West Jaintia. They were once the seat of the kingdom of Jaintia which extended till the north of the Barak Valley in Assam. 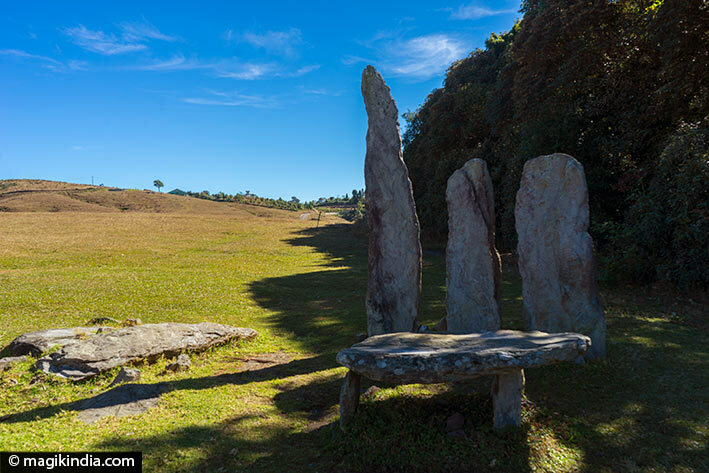 The hills of Jaintia are dotted with famous stone monoliths, subtropical forests, clear rivers and typical villages. 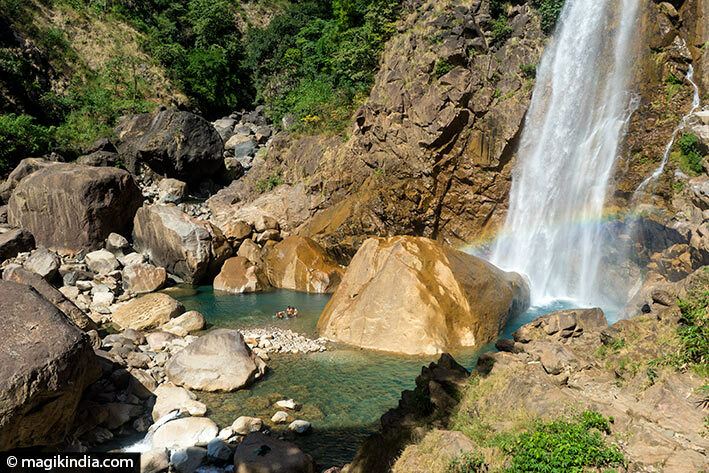 To reach the Krangshuri waterfalls, we travel about 80 km through the Jaintia hills. 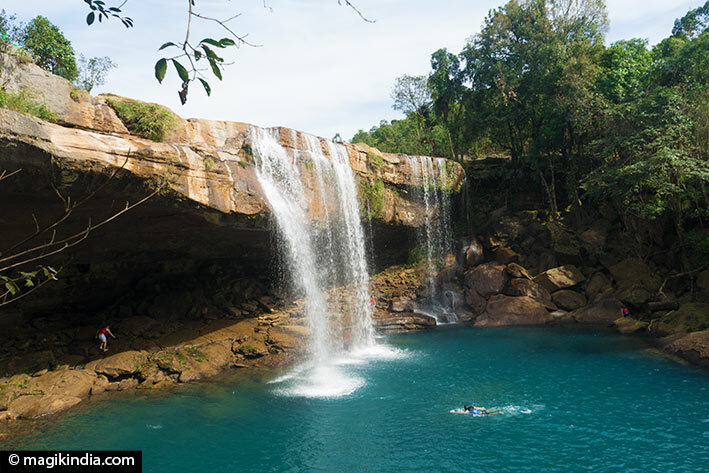 With its turquoise waters, the cascades of Krangshuri are surely the most beautiful in the district. The site is suitable for families, it is equipped with changing rooms and lifeguard surveillance. 40 km further, crossing beautiful tropical forests of pine trees, bamboos and betel nut trees, we reach a timeless place: Schnongpdeng, so rightly named ‘clear water’. A stroll on the calm and crystalline waters of the Dawki River dotted with fishermen seated in long pirogues has the effect of a deep contemplative meditation. 10 km away Schnongpdeng, we come across the Dawki border between India and Bangladesh. It is a rather friendly border that allows you to admire the beauty of nature. 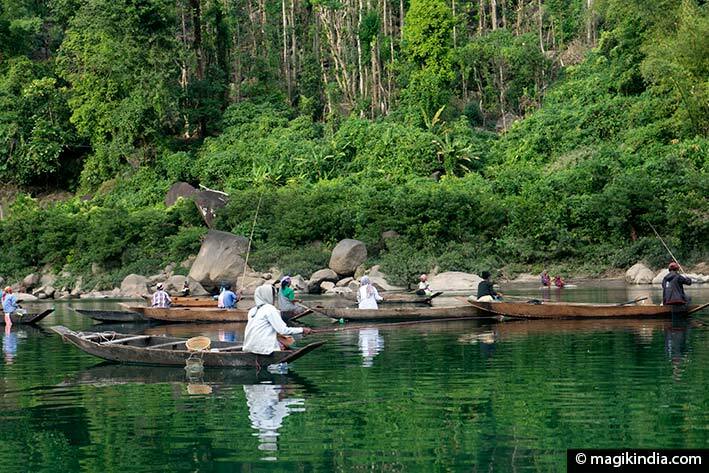 Here, the blue waters of the Dawki River Meghalaya flows into the Goyain River in Bangladesh. 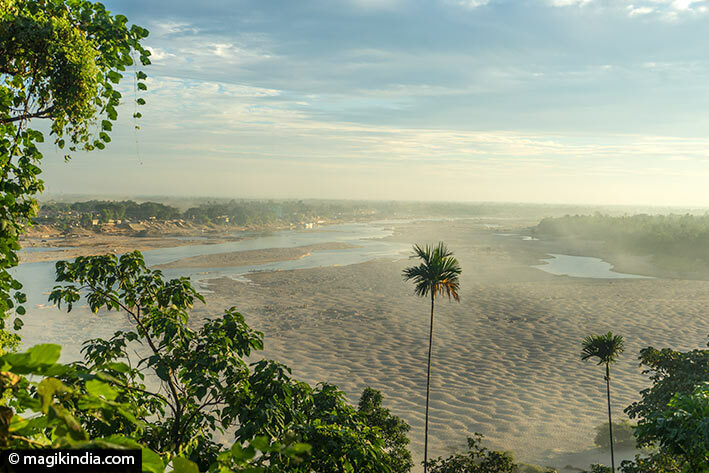 The view of the plains of Bangladesh is just splendid. We leave the Jaintia Hills to East Khasi Hills for the last leg of my trip and one of my favorite. Rather than going to Mawlynnong, which is supposed to be the cleanest village in Asia (a tourist trap), my friend Earlyborn drives me a few miles further into the small hamlet Nohwet, where a beautiful traditional homestay awaits me … A total change of scenery! 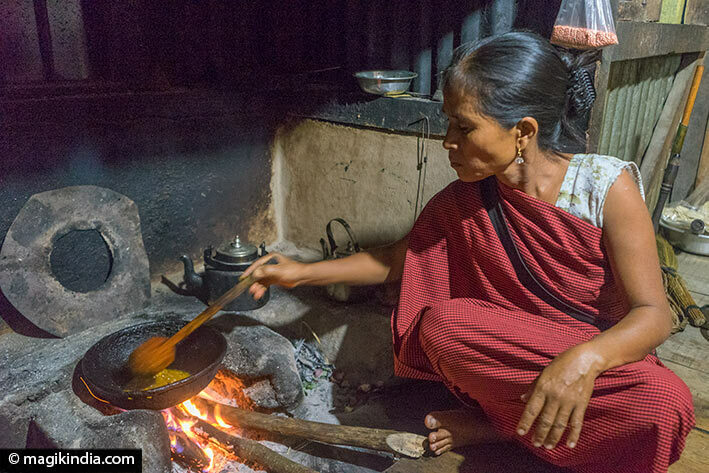 Quietness, generosity of the inhabitants and exquisite Khasi cuisine are the highlights of this homestay. 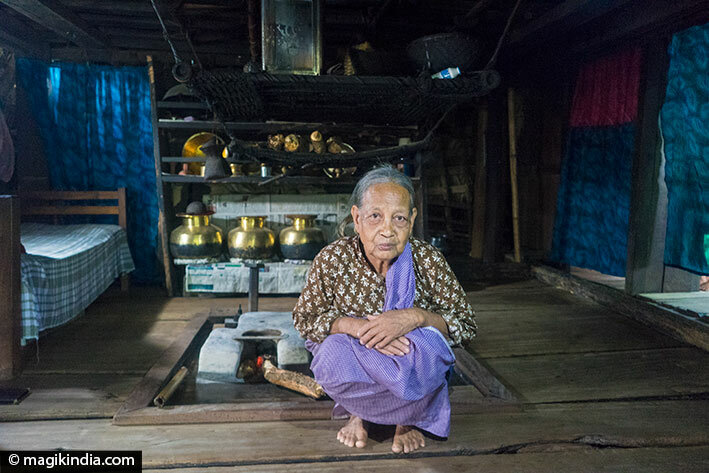 In the same village, there is a traditional Khasi house more than 200 years old. This bamboo and teak house with its various utensils is like a living museum of the traditional life of the Khasi people. Nohwet has also a 30-meter-long living root bridge overflowing the Thyllong River, considered sacred by the autochthones.